When it comes to shopping a new mattress, you may have heard about pillow top mattresses. it is easy to imagine how they look, or what they feel, or how they are different from other types of mattresses if they have experienced. However, some sleepers may haven’tknown them. That’s why we’ve gathered the list of best pillow top mattresses for you. Let’s dig deeper into this type of mattresses! Pillow top mattress implies the mattress that is designed with an extra layer of padding. This layer is loosely sewn into the top layer of the mattress. This usually makes the mattress thicker than others a bit. Is Pillow top different from Euro top? There is misleading information on this. The fact they are indeed different. The Euro top is usually sewn on the top that creates an uneven surface. It looks like a pillow. Meanwhile, Pillow top is aligned with the edges of the mattress. This makes it no lumpiness to be seen on the top. Adding more cushion – the added pad also helps to provide an extra cushion for sleepers, but it doesn’t sacrifice the support from the underneath layer. Hence, sleepers can enjoy more plush, but won’t feel stuck in the mattress. Relieving the pressure points – the added pad of the pillow top mattresses is able to relieve pressure points across your body. So, you can feel pain-fee when waking up in the mornings. Especially, those who suffer from back pain, or lower back pain, they would need a mattress that is firm a bit to be comfortable, and the extra layer just works excellently for them. The following list of the best pillow top mattress is hand-picked, which has drawn a lot of attentions from users. Probably, not every mattress mentioned has got positive feedbacks over negatives, but it may be worth their money. Let’s read every mattress to be clear about their details and for whom it is suitable. The construction is designed with high quality coils and layers of foam, making it 13.75 inches in total height. The number of coils also influences the firmness level of the mattress as a whole. A larger number of coils usually mean firmer feel and more durability. 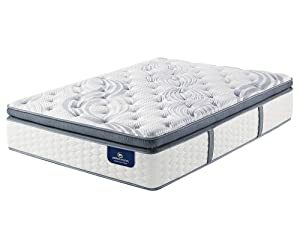 With this The 700 Firm Super Pillow Top mattress, it is constructed from Serta’s Cool Twist Gel Memory Foam and premium 886 Custom Support Individually Wrapped Coil Innerspring. This design results in great comfort and support. Aesthetically speaking, the cover of this 700 Firm Super Pillow Top mattress looks fairly luxury. In addition, the fabric used for cover is general thick and durable. All the seams are well made. All these add the luxury feel for the mattress. The 700 Firm Super Pillow Top mattress is designed to fairly firm, which makes it most suitable for some groups of sleepers including: first is stomach sleepers who always feel more supportive with firmer feel. The second is back pain sleepers that can feel painful if the mattress let them sunk too far down into the mattress. The third is heavy sleepers. Both the thickness and the firmness of this mattress are best to be used for heavy sleepers. When lying down, the foam layers just do a good job in providing cushion and comfort. Hence, they won’t feel coil system underneath. In addition, this mattress also does a good job in managing the partner’s movements. When the cooling gel foam is combined with coil system, it helps improve the breathability for the whole mattress a lot. 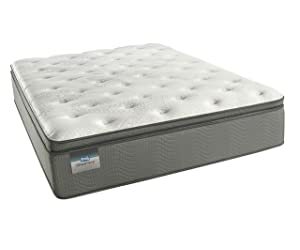 When you buy this mattress , Serta will offer you a 10-year warranty and 120-night trial period. If you end up with disappointment, return it within the trial period. 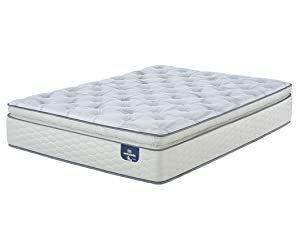 This Classic Brands Mercer pillow top mattress is a combination of balanced comfort and support and cooling feel. Hence, you can sleep soundly all night long without any disturbances. Let’s discover this mattress more! The construction of this Classic Brands Mercer pillow top mattress is designed with the newest technology in bedding. To build the total 12 inches in height, the construction has 8 inches of traditional innerspring wrapped coils, and the different layers of foam including: 0.5- inch top layer of gel infused memory foam, a second layer of 0.25-inch comfort foam, a third layer of 0.25-inch comfort foam and a fourth later of 0.5-inch comfort foam, and an additional layer of 0.75 inch of comfort foam. It is a quilted pillow top knit cover with a corded edge and coordinating knit sides for breathability. In addition, the cover has the beautifully aesthetical look. Firstly, you have to know that this mattress has medium firm feel. This firmness level makes it suitable for back and side sleepers. Secondly, the combination of coil layer and foam layers just makes it great in providing support and comfort. The springs give a lot of firmness, and support. It has a bit bouncy feel and it can also response to your every movement. Along with that, the memory foam softens the under layer quite a bit. 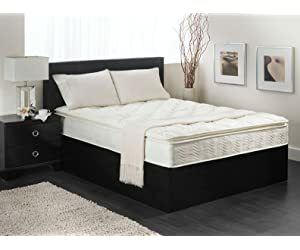 In terms of motion transfer, the mattress can perform well in minimizing the disturbance of your partner’s movements, so this mattress is good to share your bed with a partner. Lastly, both gel infusion and coil system do a good job in providing cooling feel for sleepers. The additional information you may concern about this mattress is its warranty. The answer is you will get a 10-year warranty when you buy this This Classic Brands Mercer pillow top mattress. If you will feel supportive with medium firm feel, why not take this Sertapedic Super Pillowtop 300 Innerspring Mattress into your considerations. Along with the medium firmness, it has many great things that you will be excited to experience. Let’s dig deeper into its details! The mattress is constructed from a special coil gauge design that helps create a firmer feel across the entire mattress. And then, it is combined with layer of foam that helps soften the firmness underneath. Consequentially, you can get enough support but not feel like lying in quicksand. In general, the mattress has balanced combination of support and comfort. You can be easy to feel the great contour from it right from initial touch. The medium firm feel just makes it great to give support for side and back sleepers. However, those who weigh heavily may feel less supportive due being sunk fairly deep down into the mattress. Additionally, the mattress can produce cooling feel because the construction includes Serta’s Cool Twist Gel Foam Serta’s Cool Twist Gel Foam. The mattress will include a 5-year warranty when you buy this Sertapedic Super Pillowtop 300 Innerspring Mattress. If you need something fairly firm to feel supportive, let’s Sealy Response Essentials mattress help you. Though it comes with pretty firm feel, it still has contour and moderate sinkage. This makes it just great in providing comfortable sleeping surface for sleepers. The total thickness of Sealy Response Essentials mattress comes in 8.5 inches. It is constructed from a combination of solid coil system and layers of foam. It is a woven fabric cover. It adds an extra cushion for sleepers. Along with that, it is durable to protect the entire mattress. Aside from these, the fabric is also breathable, which reduces the heat retention in the mattress. The total thickness of Sealy Response Essentials mattress is designed to be fairly firm. 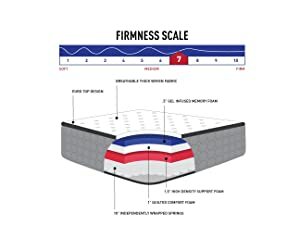 If we rate 10 as the firmest level on the firmness scale, this mattress probably lies between 9 – 9.5 out of 10 on the firmness scale. So, stomach sleepers will feel pleased with the support of the mattress. Who else would feel supportive when lying on this mattress? Those who suffer from back pain also feel comfortable when lying on this mattress. It won’t be too stiff to aggravate their pain. The layers of foam just do a great job in softening the underneath layer and providing comfort. Lastly, the mattress is able to keep heat retention at zero level. Unlike other mattresses that come with fairly long-year warranty, this Sealy Response Essentialsmattress just has 3-year warranty. 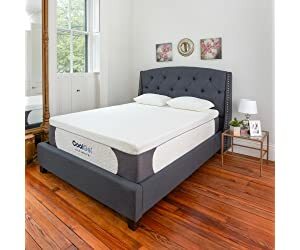 For those who are more into all-foam mattresses, this Classic Brands Cool Gel Ultimate Gel Memory Foam 14-Inch Mattress has many great things that can make you pleased with it. What are they? Let’s see below. The construction of this mattress is designed to be fairly thick, which comes in 14 inches in thickness. It includes 2-inch top layer of ventilated Cool Gel memory foam, a layer of 2-inch memory foam, a 2-inch comfort, and a 8-inch base layer. It is a stretch knit fabric cover with waterfall edge and matching knit side panels. In general, it looks nice and feel soft to touch. Due to all-foam design, the mattress can create pronounced sinkage and contour. Your body will be contoured easily, so you can feel more hug. However, it is also designed to fairly firm, so you won’t be sunk too far down into the mattress. As a high recommendation, the mattress will be good to be used for back and stomach sleepers. Meanwhile, those who sleep on their side may be not as comfortable as side and back sleepers. 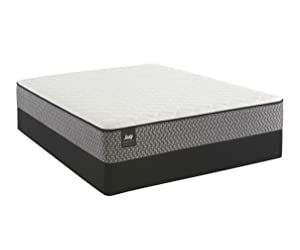 More ideally, when you buy this Classic Brands Cool Gel Ultimate Gel Memory Foam 14-Inch Mattress, you will also get a long-year warranty that lasts 25 years. Having been designed to be not too firm or too soft, this Textrade USA Inner Spring Pillow Top Mattress would make side and back sleepers feel pleased. Along with that, who else should consider this mattress when choosing a best mattress? The Textrade mattress is constructed with 1000 15-gauge tempered steel coils and 3-inch thick pillow top of layered 20 Denier foam. All layers form 11 inches in total thickness. 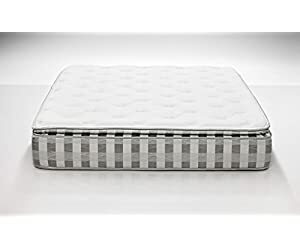 Especially, the premium quilted pillow top mattress has anti-microbial fibers and layers of soft comfort foam in the pillow top for a healthier sleeping surface. It is Damask quilted fabric cover and comes in white tone. The fabric used is soft, durable and breathable. All features create a great quality for the cover. Aesthetically speaking, the cover just looks simple and nothing that is impressive to talk about. Though, the mattress does exist some cons, the pros far outweigh the cons. In general, the mattress can provide a great comfort and support. Sleepers can feel the contour easily; it will be contouring to every curve of body nicely. In terms of firmness, it should be described as medium firm feel. This firmness level makes it most suitable for back sleepers and side sleepers. How about motion transfer? The nice thing is the mattress can absorb the partner’s movements. So this mattress can be suitable for sharing bed with a partner. Lastly, it is also the big concern when choosing a new mattress, it is about heat retention. The answer is the mattress can minimize to keep the heat retention at zero level, so sleepers can be worry-free. Regretfully, there is no information on warranty made public on some online shopping sites. So, this is still unclear. Does a mattress made in 100% USA make sense when you choose a mattress? If yes, let this Dreamfoam Bedding Ultimate Dreams Crazy Quilt Pillow Top Mattress added into your list of best pillow top mattresses. The construction comes in 11 inches in thickness. It is constructed from good materials that can ensure your comfort and support. 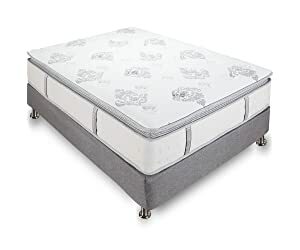 Especially, the foams used also have the Certi-Pur US Certification.However, the descriptions for the construction of this mattress aren’t clear enough. So, probably, some customers feel unpleased and want to know more. The cover is made from soft and breathable fabric. It adds a bit cushion for sleepers. Along with that, the cover does a good job in protecting the core. If you read many reviews on this Dreamfoam Bedding Ultimate Dreams Crazy Quilt Pillow Top Mattress, you will see that most of them claim medium – firm feel. This makes it suitable for stomach sleeper rather than side sleepers. In addition, this firmness is also good to keep maintaining proper spine alignment. And, it helps a lot in relieving pressure points across your body. When you purchase a mattress from Dreamfoam Bedding, the warranty you get won’t be the same. You may get 10 or 20 year warranty that depends on the mattress you choose. If you prefer a mattress that includes a long-year warranty, this Mattress America Frost mattress would be a great choice. However, who should sleep on this mattress? Let’s see the following details to know more. To form 13-inch mattress, the construction is made of a 3-inch thick layer of foam and a 10-inch pocket coil core. The foam is also gel-infused, which helps solve the heat retention. Meanwhile, the innerspring layer is made of solid coils to enhance the durability and provide the firmness for the entire mattress. Fabric used for making the cover is thick to add an extra cushion for sleepers. In addition, it is also breathable so that it doesn’t absorb and retain heat. When touching, the initial feel is super soft. To describe how firm this mattress is, many users say that it gets medium firm. This firmness level just makes it great for back pain users. It won’t let them sunk too far to cause discomfort. Also, it doesn’t aggravate their pain at all. In addition, this mattress is beneficial to side and back sleepers who are comfortable with softer feel and more into plush feel. Definitely, due to being not too soft or too stiff, it is good at maintaining your proper spine alignment. The mattress comes with a long-year warranty that lasts 25 years. So, this is a big deal when you buy Mattress America Frost 13 Inch Hybrid Pocket Coil Pillow Top Mattress. The next recommendation for the best pillow top mattresses is Sleep Inc. 15-Inch Complete Comfort 700 Pillow Top Mattress. Along with medium firm feel, what others it has? To build this 15-inch mattress, it is built from traditional innerspring and foam. Especially, it features 360 Degree Foam Encasement as the way to enhance edge support. In addition, it features the Gel Infused Lumbar Band that enhances support to the lumbar region. Aesthetically speaking, the cover just looks nice in its own way. Meanwhile, it has a soft feel and breathable feature. To sum up, the cover has achieved both aesthetic design and great feel. In general, you can feel the softness easily with the initial touch. When lying, it will be instantly contouring to every curve of your body and then let you feel supportive. In addition, the innerspring layer just does a good job in providing firmness and prevents sleepers from being sunk too far down into the mattress. Hence, you will never be stuck in there. What else? The edge support of this mattress is fairly good due to having 360 degree foam encasement. If you purchase this mattress, you will also get 10-Year warranty that is 1-Year Non-Prorated and 9-Year Prorated. The last recommendation in our list would bring you a unique feels for comfort and support. However, there are not many descriptions on this mattress that can be found easily. This makes it less outstanding from the crowd. 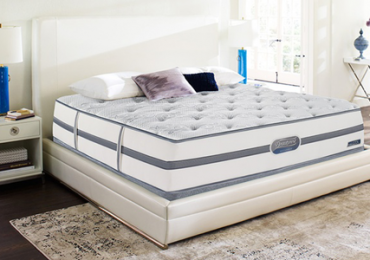 This Simmons BeautySleep mattress is made of high quality coils and foam, so that it can provide a good comfort and support. The coils are also solid, which makes the mattress firmer but not stiff. The fabric used is fairly thick and durable, which adds a bit cushion for sleepers. Along with that, it is also breathable, resulting in a cooling feel for sleepers. 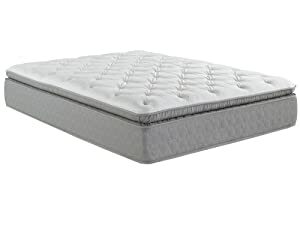 To talk about the firmness level of this Simmons beautySleep, it should be described as soft feel. It makes the mattress suitable for side sleepers. If we rate 10 as the firmest level, this mattress would get smaller 5 out of 10 on the firmness scale. In addition, overweight people should consider first before choosing the mattress because it can let them experience more sinkage. Others who may feel unsupportive with this mattress are stomach sleepers. It is too soft for them. The mattress will include a 5-year warranty if you purchase it.